Form Description: Becoming a babysitter is a great way for teens to earn a bit of extra spending cash, and also a great way for them to start learning about how businesses work. One way to help ensure that your teen can learn all they can, get the instructions that they need, and ensure that they receive the agreed upon rate is by using a Babysitting Contract. Not only will your teen be able to have some detailed instructions, but also a firm agreement as to what type of compensation they will receive. Who ever said that your personal paperwork needs to be boring? 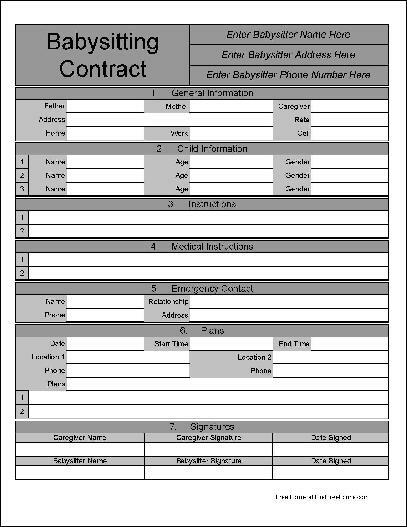 Have a little fun with your paperwork by using this fancy version of the babysitting contract. It still allows you to maintain all of the important information that you need to keep straight, but also allows you to have a bit of fun at the same time. This form ("Fancy Babysitting Contract") is associated with the following keywords: babysitting, child care, contract, teens, simple, fancy.